NEW YORK (CNNMoney) -- Google's recent change to its search algorithm has dramatically shaken up the businesses of websites that moved up or down its search rankings. Sites whose rankings rose to the top found that their traffic and revenue soared -- but the adjustment had an equally devastating effect on those that were dropped. The Online Publishers Association, a group of content producers comprising many of the Internet's largest properties (including CNN.com), estimates that the algorithm change shifted $1 billion in annual revenue. Some of the losers felt the hit immediately. Mahalo.com laid off 10% of its workforce last week thanks to what CEO Jason Calacanis called "a significant dip in our traffic and revenue." The stakes are high in the Google-placement game. The top spot on a search page typically attracts 20% to 30% of the page's clicks, according to Adam Bunn, SEO director of Greenlight. After that comes an enormous tail-off: Positions 2 to 3 generate 5% to 10% of the clicks, and links below the fold receive less than 1% of users' attention. Fall off to the second page and your search-engine-driven clicks will be negligible. That means that positioning in Google's search results can be a life-or-death issue for a business. Google's change appears to have most harmed so-called "content farms" like Mahalo, which critics say amass content for the sole purpose of luring in search-engine traffic. Sites like Mahalo.com, Wisegeek.com, Ezinearticles.com and Yahoo's (YHOO, Fortune 500) Associated Content were among the biggest losers in the algorithm tweak. 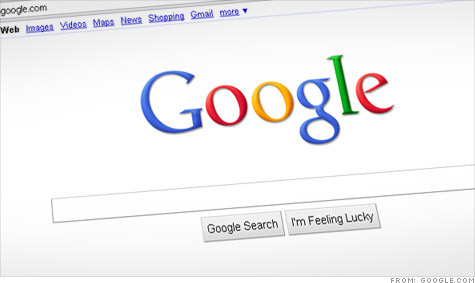 Google-generated traffic to each dropped more than 75%, according to software firm Sistrix. Interestingly, Demand Media (DMD) -- one of the most oft-criticized content farms --appears to have gotten off relatively scot-free. Its most prominent site, eHow.com, even grew its traffic after the algorithm change, though some others like AnswerBag.com and Trails.com dropped off. The biggest beneficiaries seem to be originators of what Google calls "high-quality" content, which the company defines as "information such as research, in-depth reports, thoughtful analysis and so on." Traffic to sites that belong to the Online Publishers Association grew between 5% and 50% the day after Google's tweak, according to Pam Horan, president of the OPA. "This change was connected with who is driving the best experiences for the end user," Horan said. "This is good for the consumer, good for the Internet, and good for publishers of higher-quality content." Max Spankie, who operates customer review website My3cents.com, said his site lost a significant portion of its traffic and revenues overnight following Google's algorithm change. That came as quite a surprise to Spankie, since My3cents.com was recently recognized as the top consumer complaint site by the non-profit Consumer Federation of America. Unlike some of the sites that now top My3cents.com in Google's rankings, all complaints on Spankie's site are moderated. Hundreds of companies use the site to interact with customers. "I thought they flipped the switch wrong," Spankie said. "We work hard to be a quality site, and I definitely think the sites that are now winning in our niche aren't about quality." Morris Rosenthal, a publisher of laptop repair how-to books and owner of the site FonerBooks.com, said that he too found Google's new results curious. For instance, a search for his book Laptop Repair Workbook now puts the book's Amazon page as its first result (no problem there) -- and a site that allows you to illegally download his book as its second result (big problem). He also noticed that a search for "laptop inverter test" -- a diagnostic test he wrote an instructional article on -- now features two sites that link to his article ahead of his own site. His site used to be the top result. For those who feel that Google made a mistake by lowering their sites in its rankings, the company says there's an option: Webmasters can post in its discussion forum about the topic. Though no manual changes can be made, Google will often tweak its algorithm in response to legitimate challenges. "Like many of the changes we make, we tested this update extensively and have found that the algorithm is extremely accurate at detecting site quality," a Google spokesman said. "That said, search is a constant evolution and we will continue to listen to feedback from publishers and the community as we further refine our algorithms." Google said it is "very pleased" with the changes. But that's cold comfort to those who have seen their traffic and revenue tumble with little explanation why. "It's a system of guilty until proven innocent, and I've read about a lot of mom-n-pop sites reworking their sites and examining their souls, trying to figure out if they offended Google in some way," said Rosenthal, who said traffic to his site tumbled 30%. "With Google it's just, 'Talk to the hand.' They have no genuine two-way communication." Correction: An earlier version of this story incorrectly reported that the Online Publishers Association expected $1 billion in advertising revenue to shift to its members following Google's algorithm change. The group says its actual estimate is that $1 billion will be redistributed across the online publishing industry.